The question of non-locality in quantum mechanics is of interest to a great number of people. Unfortunately it can be rather confusing, and sometimes comments on the subject are somewhat muddled - for instance claims of faster than light signalling. For this reason Tim Maudlin's book is especially welcome - it gives a clear account of the subject without needing too much prior knowledge. Chapter 1 goes over the main arguments concerning Bell's inequalities and their violation. The rest of the book then goes into more detail. In particular the second chapter serves as an excellent introduction to the special theory of relativity - athough there is some mathematics used this is not too taxing, and is supported by plenty of diagrams. The central question addressed by this book is "Does the violation of Bell's inequalities imply that something is travelling faster than light". You probably already know the answer - no. However, If you want to model such happenings (say on a computer) then you will definitely need to have something corresponding to superluminal effects, (or else include the minds of the experimenters in your model). But there is no reason to assume this implies a level of reality beneath that which we can observe in which such superluminal effects really occur. In the third and fourth chapters Maudlin examines many possibilities for hidden superluminal effects but always concludes that they are not tenable. I have to say that sometimes the book does seem to go over the same arguments again and again. However, I feel that this is inevitable in a philosophical book, and Maudlin does not let the text get out of control - he manages to keep the book to a reasonable length. The fifth chapter, 'Causation' is more philosophical than the rest of the book, but definitely worth reading. Maudlin argues that although Bohr was considered by many to have 'won' the argument about EPR, in fact it is very difficult to make any sense out of what Bohr said, and that the EPR argument did show something of significance - that it is impossible to have a local non-deterministic model of quantum theory. Unfortunately the resulting majority viewpoint seemed to be just the opposite - a local non-deterministic interpretation. John Bell saw that there was a problem with this - he realised that any local theory had to be deterministic. This was the the inspiration for his inequalities, which rule out such a local, deterministic theory. Unfortunately, again this has been misinterpreted, and Bell is often seen as attacking determinism. There are a couple of chapters looking at the question from a slightly different angle. Having shown that it is impossible to model what happens without superluminal transmission of information, in the sixth chapter Maudlin looks at how many bits of information would need to be sent in order to explain the results. Then in chapter 8 he asks "Can General Relativity be of any help?" Possibly superluminal information transmission through wormholes could explain the quantum correlations. Once again, the answer is that it is that this doesn't really lead anywhere - if GR gave a definite mechanism for superluminal information transmission, then you would expect to have superluminal communication rather than just superluminal correlations. Entanglement of quantum states is a favourite subject for experimentation at present, with frequent reports in the press on the work of scientists such as Anton Zeilinger and Alain Aspect. Popular science books often devote a chapter to the explanation of Bell's inequalities. If you aren't an expert in the subject then it is useful to be able to check that such reports aren't claiming more than the science has shown to be the case, and this book fills that need admirably. 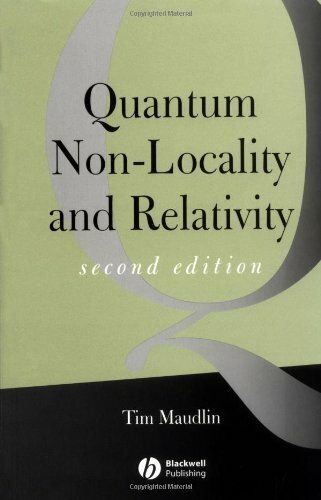 All in all I would recommend this book to anyone who has an interest in quantum theory, relativity or non-locality. As I've said, sometimes the arguments seem repetitive, but this doesn't really detract from the book. It brings out some of the important points very clearly, and does not require too much academic background, either from the philosophical or the mathematical point of view.